I wrote my friends in France to express my overwhelming sorrow and also my solidarity, and they wrote back, both grateful and even deeper in shock. I texted that news to my son and wife, and shared it with other family members and with friends through my Facebook feed. Crying face emojis registered they had heard the news, the depth of emotion understood despite the simplicity and relative ubiquity of the symbol. One of my friends and former colleagues posted that it was hard to believe it’s really gone, and I wrote, “I refuse to accept it. I simply refuse.” and punched the “post” button. But I rescinded the comment a few minutes later when one of my Twitter friends affirmed there was no hope of saving it, and others began waxing philosophical about appreciating what you have while you have it because you never know what tomorrow will bring. What the future holds, no one can tell. We say that all things come to an end, and in the physical universe at any rate, that is basically true. 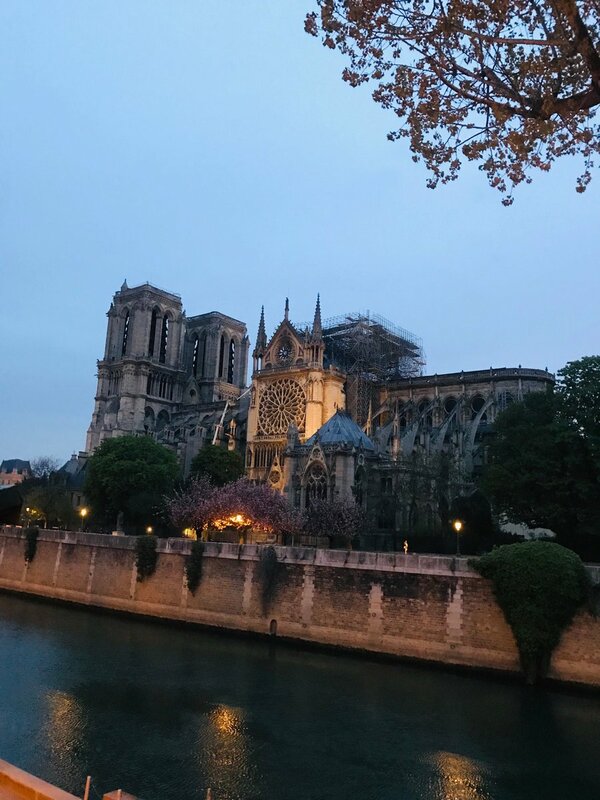 Whatever else happens to the cathedral, which the French government is already talking about rebuilding, the 800-year-old beams and rafters are indeed gone forever even if memories and images live on. But the surviving façade may yet anchor the recreation of a “new” cathedral where the old one stood. We may hope.